Mayor of London Boris Johnson has today proclaimed that London leads the world in digital radio with over 60 digital radio stations, the most of any major city in the world. 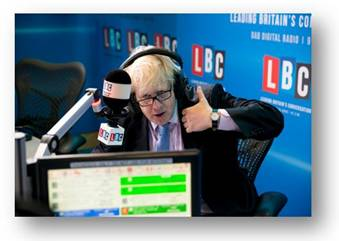 After broadcasting his regular LBC radio show ‘Ask Boris’, the Mayor joined forces with Ed Vaizey, Minister for Culture and the Digital Economy, at the Global studios in London’s Leicester Square, to celebrate the diversity of London digital stations and to announce the launch of three new London stations and a new national station. The Mayor said that "as a world beating city bursting with creativity and diversity, it is fitting that London can claim the most digital radio stations on DAB. With increasing connectivity across the city, Londoners have a wealth of listening choices whether at home or on the move." Londoners can receive up to 65 stations on DAB digital radio ranging from national stations such as Classic FM, LBC, BBC Radio 6 Music, Kiss and Absolute Radio, to local stations including language stations like Polish Radio London, Voice of Russia, French Radio London, Sunrise and Panjab, as well as specialist music and speech stations including Fun Kids, BFBS, Jazz FM and Gaydio, among many others. Much of London can also receive local DAB stations from the Home Counties. A list of London DAB services can be found below. Yesterday, Global Radio confirmed that it is launching two digital stations – Smooth Christmas on 15 November, and the brand new Smooth Extra on 27 December (replacing Smooth Christmas), with the main Smooth Radio service continuing on local DAB, FM and AM. The new London digital stations announced were financial station Share Radio which launched this week, and new extensions of Kiss Radio, Kisstory and Kiss Fresh which launch in January on London DAB. Bauer Radio CEO Paul Keenan also announced that London station Magic would launch as a national station on DAB in January, taking it head-to-head with the new Smooth Extra service. According to the latest statistics and RAJAR audience research, digital radio is very popular in London with over 63% of radio listeners listening on a digital platform each week, and fewer than 30% of Londoners now listening to only analogue radio (FM/AM). In London homes, the share of digital listening now exceeds the share of analogue listening. 54% of Londoners now have a DAB digital radio. Following a boost to the London digital radio signal in London in 2012, DAB coverage reaches nearly 100% of the population and all roads. Additionally, there is now 4G coverage across the whole of Greater London and 150 London Underground tube stations have Wifi which means that commuters can also listen to radio on smartphones whilst on the move. BFBS (The British Forces Broadcasting Service) announced at the London event that they were broadcasting from the Royal British Legion “Silence in the Square” event in Trafalgar Square to commemorate Armistice Day. ...plus a variety of services via local DAB services overlapping in to London, notably from Bedfordshire, Buckinghamshire and Hertfordshire, Essex, Kent and Surrey.